This section contains the various teaching and educational materials available on overfishing.org. 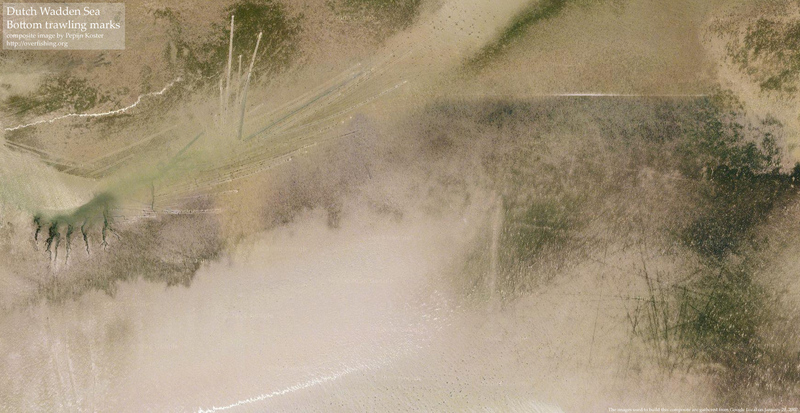 Downloadable material as well as the references for the data used in the materials can be found here. Please see this page for usage rights. Feedback and new additions are always appreciated! A quick and accessible infographic or "one minute crash course to overfishing". Available as image file (online preview), PowerPoint presentation and as a zip file with ten separate images. 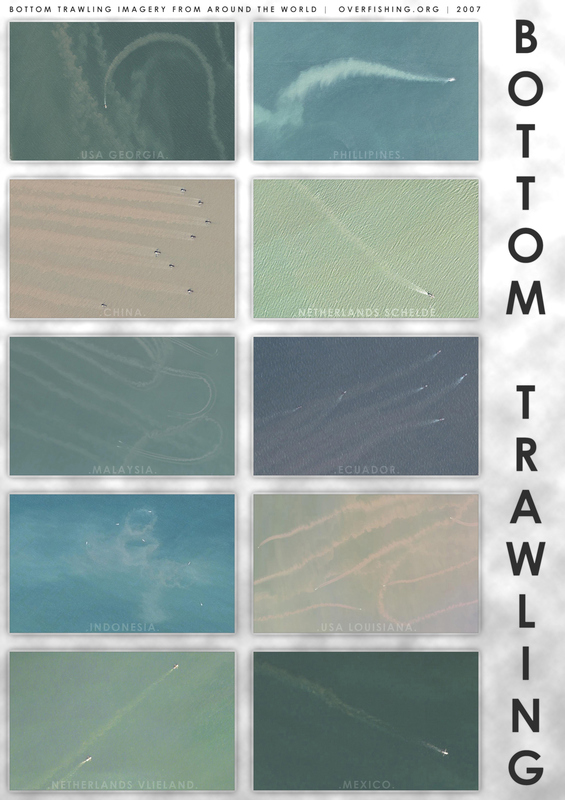 Two different types of posters showing examples (from eight countries, shots from Ecuador, USA (Georgia and Louisiana), Netherlands (Vlieland and Westerschelde), Philippines, China, Malaysia, Indonesia and Mexico) of bottom trawling as captured by aerial and space imagery. This page has some previews. 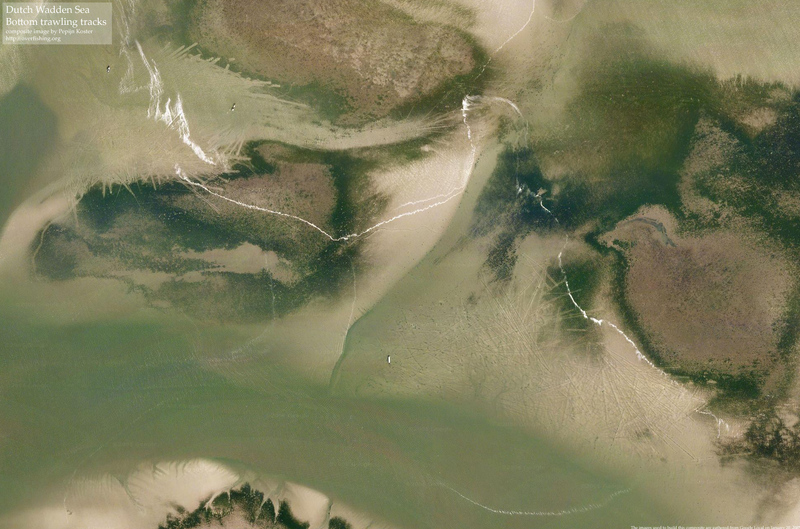 An interactive Google Earth layer (.kmz file) showing the demise of recently lost marine animals. With extinction facts, images, locations and descriptions of the Steller's Sea Cow, Great Auk, Caribbean Monk Seal, Japanese Sea Lion, Labrador Duck, Tasman Booby, Yangtze River Dolphin, Pallas's Cormorant, Guadalupe Storm-petrel, Small St Helena Petrel, Eelgrass limpet, New Zealand grayling and the Large St Helena Petrel. This spot used to link to a number of videos. Now these have been compiled into a special page with a list (almost a top ten list..) of good documentaries and movies on the topics of overfishing and destructive fishing (and the social & environmental damages these have). Many of the videos can be streamed directly from the internet and provide good insights in the issues discussed. See: documentaries about overfishing.